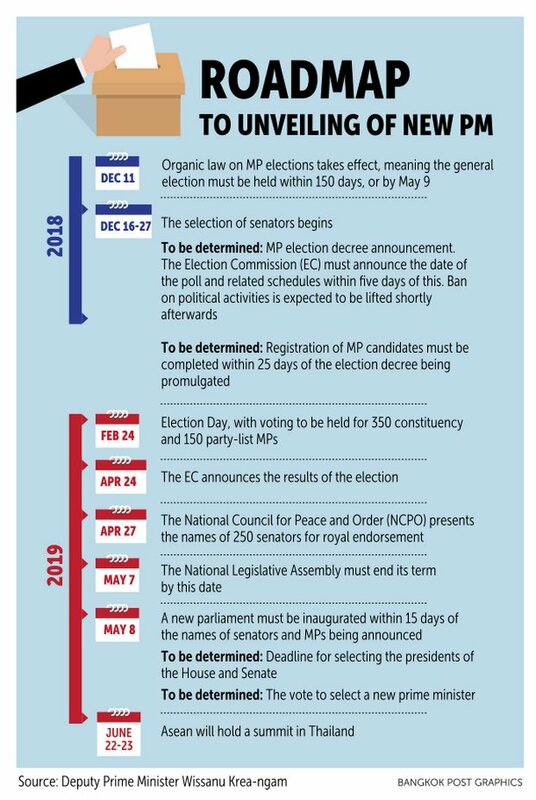 The government has revealed a political timeline, with the ban on political activities expected to be lifted shortly after the law on the election of MPs is enacted on Dec 11. 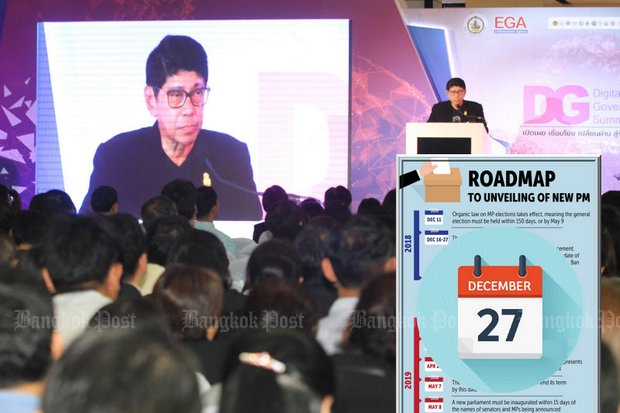 Deputy Prime Minister Wissanu Krea-ngam explained on Thursday the details of the timeline related to the general election. He said the bill on the election of MPs, which was royally endorsed and published in the Royal Gazette in September, will take effect on Dec 11. Mr Wissanu added that the National Council for Peace and Order (NCPO) is expected to lift the ban on political activities shortly after the bill becomes law. Of the constitution's 10 organic laws, the bill on the election of MPs is the last to be promulgated due to a 90-day waiting period imposed by the National Legislative Assembly (NLA). 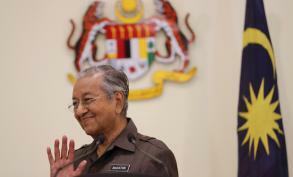 Mr Wissanu said the timeline was drawn up in consultation with the Constitution Drafting Committee, the Council of State, which is the government's legal advisory body, and the Election Commission (EC). He pointed out that an election will be held within 150 days of the law on the election of MPs taking effect on Dec 11 -- or by May 9 of next year at the latest. However, after the government held talks with the EC and other state agencies, it was agreed that Feb 24 is the most appropriate date for holding an election, Mr Wissanu said, adding that the poll could not take place earlier than Feb 24. There would be little time to prepare if the poll was held before Feb 24, he said. After the law on the election of MPs takes effect, the EC must draw up a royal decree on the election and forward it to the cabinet for consideration. The cabinet will then submit the draft for royal endorsement. When the decree is royally endorsed and takes effect, the EC will announce the election date within five days. The EC must also announce the election constituency boundaries, the number of MPs for each constituency within this five-day period. Applications for MP candidates must open within 25 days of the election decree being promulgated. Each political party must also submit a list of up to three prime ministerial candidates to the EC within five days of the MP candidacy applications being open. The timeline also includes the selection of senators between Dec 16-27. During this period, the EC will select 200 senator candidates at district, provincial and national levels. The EC will then submit a shortlist of 200 senate candidates to the NCPO on Jan 2 next year, so that the NCPO can narrow the list down to 50. Under the charter, the first Senate will comprise of 250 members from two selection processes. 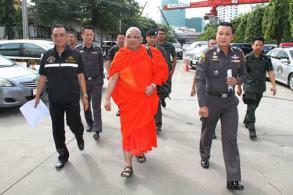 The EC is responsible for supervising the selection of 50 people while 194 seats will be handpicked by the NCPO. The other six seats are reserved for the leaders of the three armed forces, the supreme commander, the permanent secretary of defence, and the national police chief. Between Dec 16-27, the NCPO is also expected to lift the ban on political activities so parties can begin election campaigns ahead of the poll. Election campaigns are currently prohibited by the NCPO. Addressing the status of the current government, Mr Wissanu said the current government is not a provisional one and it still has full authority in running the country. A provisional clause of the constitution also gives the current government full authority to govern the country until a new elected government is sworn in, Mr Wissanu said. He also said that cabinet ministers who now concurrently serve as executives of political parties should be careful in juggling their dual roles. While there is no law banning cabinet ministers from serving as party executives, they must not use the state's time, resources and personnel for the benefit of their parties, Mr Wissanu said. He referred to four cabinet members who are at the helm of the Palang Pracharath Party; Industry Minister and party leader Uttama Savanayana, secretary-general and Commerce Minister Sontirat Sontijirawong, deputy party leader, Science and Technology Minister Suvit Maesincee and PM's Office Minister and party spokesman Kobsak Pootrakool. Meanwhile, EC secretary-general Jarungvith Phumma said the poll organising agency was conducting a final check on the new 350 constituency boundaries in 77 provinces. The list of the new boundaries will be sent to EC chairman Ittiporn Boonpracong for approval today before being published in the Royal Gazette, Mr Jarungvith said. Addressing reports that some international organisations as well as the European Union had sought permission from the EC to observe next year's polls, Mr Jarungvith said that this is normal practice. In past elections, the EC invited observers from Asean countries. Meanwhile, Thai observers have also been invited to observe elections in other countries such as Cambodia and Malaysia, he said.